"Hero of the Trojan War"
Achilles was born to his father Peleus, King of the Myrmidons, and his mother, Thetis, a sea nymph. His father was a great man and inherited the Myrmidons. His mother on the other hand had several affairs with the gods and many men. Soon after Achilles was born his parents were informed that he would die in Troy at a young age. To prevent this from happening, his mom took him and dipped him into the River Styx thinking that that would make him immortal. But she didn't dip the heel that she was holding him by, therefore making that spot vulnerable to fatal wounds. 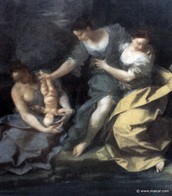 "But others affirm that she, without the knowledge of the child's father, used to put the babe in the fire by night in order to destroy the mortal element which Achilles had inherited from Peleus, while anointing him with ambrosia during the day" (Parada).But despite his mother's attempts to make him immortal, his father disapproved and Thetis soon left him. 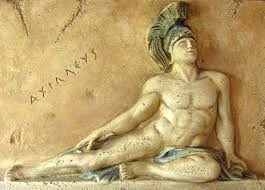 During his childhood, Achilles mom tried to prevent him from going to Troy . 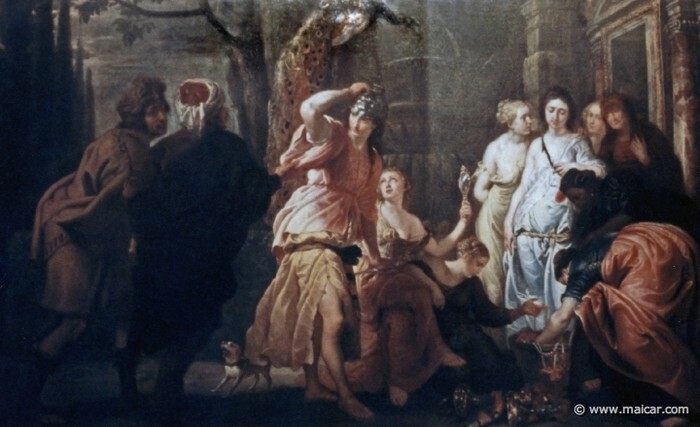 "Thetis, knowing that Achilles was fated to die at Troy, disguised him as a girl and hid him among the women at the court of King Lycomedes of Skyros" (The Iliad). Although these measures were taken to guard Achilles, fate came in the way when Odysseus convinced him to fight in Troy. 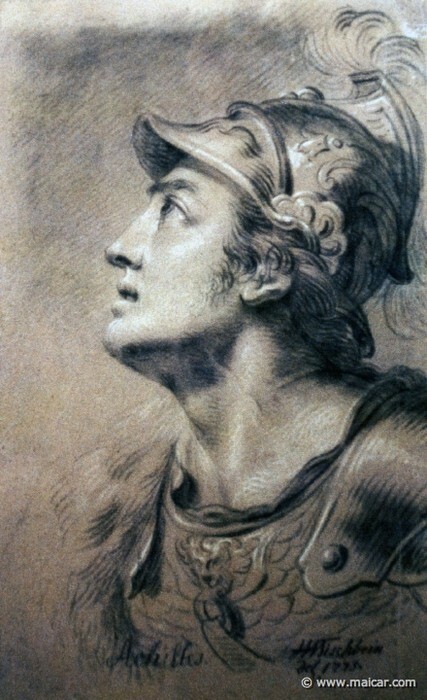 Achilles was known to be the Hero of the Trojan war that led the Greeks to victory. 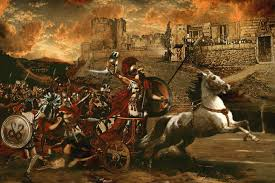 After being convinced by Odysseus to go and fight, he destroyed 12 cities surrounding Troy. But Agamemnon stole the captive princess Briseis and discouraged him from fighting anymore. He then lent his armor to Patroclus, his lover, and she led the Myrmidons in battle but was soon killed by Hector. With rage, Achilles united the Spartans and killed Hector; Achilles then dragged Hector's body on the back of his chariot to the Greek camps. Although he killed Hector, the Greek's were still retreating from this powerful Trojan city. "Finally the Greeks built a large hollow wooden horse in which a small group of warriors were concealed. The other Greeks appeared to sail for home, leaving behind only the horse and Sinon, who deceitfully persuaded the Trojans, despite the warnings of Cassandra and Laocoön, to take the horse within the city walls. At night the Greeks returned; their companions crept out of the horse and opened the city gates, and Troy was destroyed" (Trojan War). Some say that Achilles was killed at the Scaean gate at Troy. 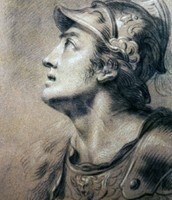 Others believe that its was only Apollo who killed him. Even though his parents took preventive measures, fate still caught up to him. "The Iliad concludes with the funeral rites of Hector. It makes no mention of the death of Achilles, though the Odyssey mentions his funeral" (The Editors of Encyclopedia Britannica). Britannica.com. The Editors of Encyclopedia Britannica, n.d. Web. 7 Nov. 2014. The Iliad. N.p. : Playaway Digital Audio, 2012. Print. 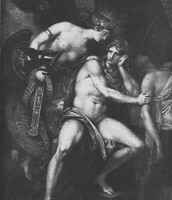 Achilles Death. Galleryhip.com. N.p., n.d. Web. 11 Nov. 2014. 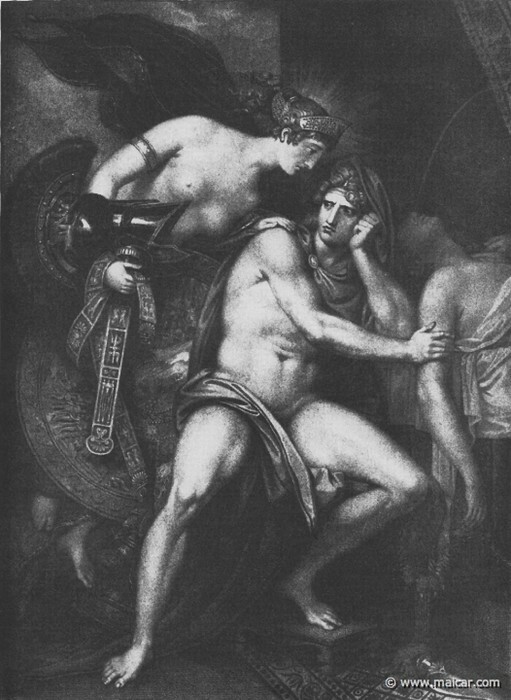 Achilles Dragging Hector. Wikipedia.org. N.p., n.d. Web. 11 Nov. 2014. Thetis Dipping Achilles. Maicar.com. N.p., n.d. Web. 11 Nov. 2014. Achilles as a Girl. Maicar.com. N.p., n.d. Web. 11 Nov. 2014. Mourning Over Patroclus. Maicar.com. N.p., n.d. Web. 11 Nov. 2014.